Omnia HV & Rail Ltd - Preventive Maintenance for High Voltage Electrical Components. The OMNIA Breather has been specifically designed for use with conservator type power transformers. It removes water from the conservator air space and in doing so exerts a drying influence on the oil and in turn the paper insulation. The OMNIA Transformer Breather is designed to replace traditional dehydrating transformer breathers. In operation it is totally maintenance free for the service lifetime of the transformer. The materials and coatings used in the construction of both the breather and its associated ground mounted control cabinet have been chosen to be corrosion resistant for the life of the breather. 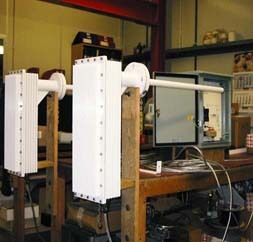 The key to the breathers operation is its Peltier Effect Modules, which are installed in a central duct within the breather body. These act as heat pumps and draw warm moist air from the air space above the transformer oil in the expansion vessel into the dryer where the air is rapidly cooled to the point where any moisture present in the air is deposited as ice on the walls of the breathers duct. This process continues for 7 hours. After this period of time the current flow through the Peltier Modules is reversed so that the cold central duct is now warmed to melt the ice that has formed. This then exits from a drain at the bottom of the breather as water. The duct is warmed until it reaches a temperature of 15 C. At this point the current flow is again reversed and the cycle begins again. The OMNIA Transformer Breather has advantages over other breathers in that it has been designed to actively pump air through the breather by using the exhaust heat from the Peltier Modules to warm the air. The Breather also only requires one mounting hole in the transformer conservator end plate. This hole is above the oil level in the conservator, so it is possible to retro fit the breather to a transformer without having to drain oil from the transformer or remove the conservator transformer conservator end plate. The content of this site is Copyright © 2007 Omnia HV & Rail Ltd.